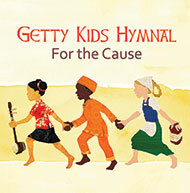 For the Cause is a collection of recordings designed to help disciple children with songs to carry for life. Inspired by many world music sounds, this album was recorded by the Getty band and five different children’s choirs from Africa, America, Colombia, India, and Ireland. Songs Track includes “All Hail the Power of Jesus’ Name”, “May the Peoples Praise You”, “Holy, Holy, Holy”, “For the Cause”, “God So Loved the World”, “O Children Come”, “Oh, How Good It Is”, “Compassion Hymn”, “Facing a Task Unfinished”, “There Is a Redeemer”, “By Faith” and “Jesus Shall Reign/Nothing But the Blood”.